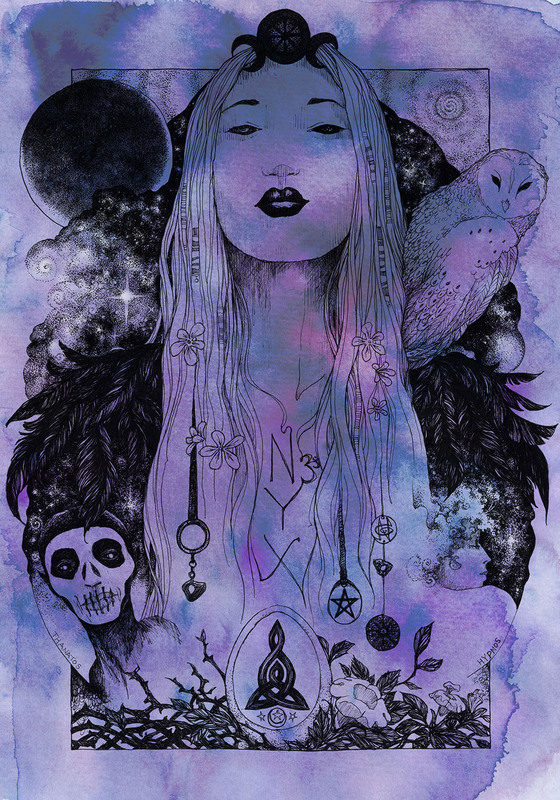 Nyx – Greek Goddess of the night, Nox in Roman myth, first daughter of Chaos. An archetypal primordial goddess. Twice every day, at dusk and dawn Nyx rides out of Tartarus in a black chariot drawn by two black steeds, and accompanied by the stars. She is draped in a long, heavy shroud, on her head a black star spangled veil, she has black wings and carries twin children in her arms. One child Thanatos is black and is death; the other Hypnos is white and is sleep. 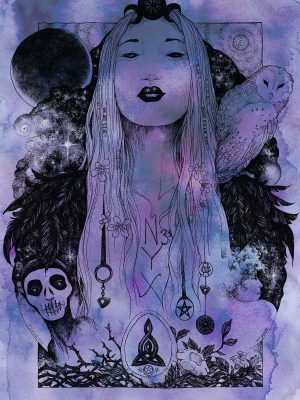 Nyx is a primordial goddess and is represented in many theologies and symbolically represents the Darkness within all of us. Nyx is the acknowledgement of the shadow, the unseen behind the veil. She asks us to bravely enter the darkness, the unknown and let it embrace us, to let go of our senses and float in the primordial ether of the cosmos. To leave our fears, attachments, regrets and desires behind us. When we honour and call on the wisdom of Nyx we are asking to enter the darkness, to acknowledge and release our fears in order to reach an awareness of how to go on.